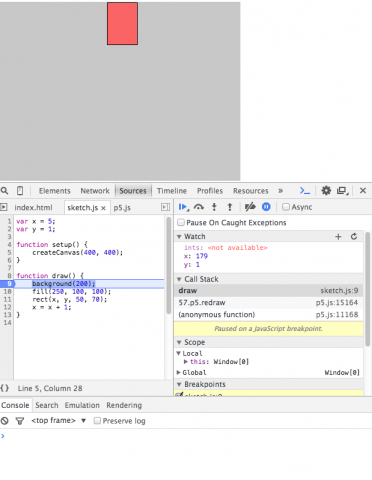 It’s the recommendation of the course staff to switch over to developing with a text editor and browser to avoid bugs in the p5.js applications integrated development environment (IDE). The process for making and running your programs will be a little different, so here is a tutorial. Pick an editor. Sublime is popular but will gently bug you to send money. Komodo Edit 9 is free. Bluefish is also free, open-source, fast and simple on the Mac, but the windows install process seems to be a little more difficulty than with others. Sublime: Go to http://www.sublimetext.com/2 and download Sublime 2 for your operating system. Komodo Edit 9: Go to http://komodoide.com/download/#edit and download Komodo Edit 9 for your operating system. Bluefish: Go to http://sourceforge.net/projects/bluefish/files/bluefish/ and download Bluefish for your operating system. Follow installation instructions carefully for Windows – you may need to download some support libraries. For projects early in the semester (no sound, no attempts to access HTML content), you can use the template-p5only.zip file. Otherwise, use template-all.zip. The “-min” templates are for your personal website or other use outside of class where you want the fastest downloads. Read more about them below. template-all.zip – p5.js library and addons. template-p5only.zip – p5.js only, no dom or sound addons. template-all-min.zip – the minimized “all” template. Lacks debugging and error checking support. template-p5only-min.zip – the minimized “p5only” template. Lacks debugging and error checking support. After downloading the template, expand it (probably you can just double-click on it in your file browser/finder/explorer) and name the expanded directory to your project name. We’ll call this your project directory. After you have saved your changes to sketch.js, you can run the index.html file inside the project directory in your browser to see your sketch. However, the browser window may not resize automatically to your canvas size. If you are submitting the Assignment to Autolab, remember to rename the project directory (folder) that contains everything (index.html, sketch.js). Rename it with andrewID_assignmentNumber_assignmentLetter, zip the folder, and then submit it. Use the View / Developer / Developer Tools menu in Chrome to open the developer tools window. Set a “breakpoint” – by clicking on line “9”, I stopped the running program when it began to execute line 9. Notice the moving rectangle stopped in mid-flight. Examine variables – by clicking on the “+” near “Watch” I can “watch” a variable. Just type the name (here, I’m watching x and y) and the current values of the variables will be displayed. Error messages will be displayed in the console (at the bottom) – If your program is not well-formed, or if something goes wrong during execution (for example, you misspelled a command), you should see a red message in the console at the bottom. Printed messages appear in the console window – look up “print” function in the p5js reference materials. Although your p5.js programs are small (on the order of 1000 bytes – smaller than a typical web page), the p5.js libraries are nearly 1,000,000 bytes, a thousand times larger. That’s still not a big problem. Your computer memory size is measured in gigabytes, yet another factor of a thousand, but still, (should I really say it?) size matters. For example, a 1 Mbps Internet connection will take about 8 seconds to load the p5.js library. Can we do better? The p5.js libraries are available online just for this purpose. I’ve made some templates based on these online versions. There are 4 versions of templates. The “p5only” versions have just the p5.js library. 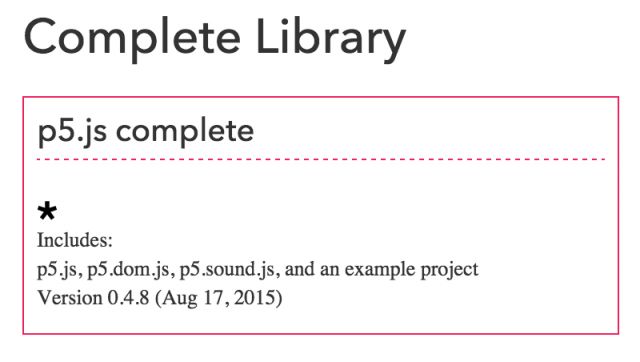 The “all” versions have the p5.js library plus the p5.dom.js and p5.sound.js addons. The p5.dom.js addon implements functions that access, create, and modify HTML documents in the browser. The p5.sound.js addon implements functions that relate to audio. The “min” versions are the same as the non-“min” versions except that the “min” versions do not have helpful debugging and error-checking features, so they should not be used unless you want the absolute smallest code and fastest execution, perhaps after your program has been carefully tested. Links to the templates appear above. I suggest you save the zip file, and whenever you start a new project, just unzip a new copy of the template directory and rename it to remind you what the new project is about. Then edit the sketch.js file inside. You can also work with the p5.js library download. Go to http://p5js.org/download/ and download the “complete library”. Keep in mind that you only need index.html, p5.js, and sketch.js for your project unless you would like to use the addons. If you would like to move files out of the empty-example folder, you will need to change their path name in index.html. It’s not necessary, but feel free to ask questions about that. The problem with this library configuration is that it has two levels of nested folders. A complete project consists of the p5.js file PLUS the empty-example folder PLUS the sketch.js and index.html INSIDE the empty-example folder. SO, you must rename and zip the parent folder (originally named p5) containing everything (p5.js + empty-example folder). That’s why we now recommend the template zip files — they’re smaller, have fewer files, and have no nested folders. *The only catch is that if you are off-line and you use this on-line copy of the library, the browser may be unable to load and execute your local p5.js program.